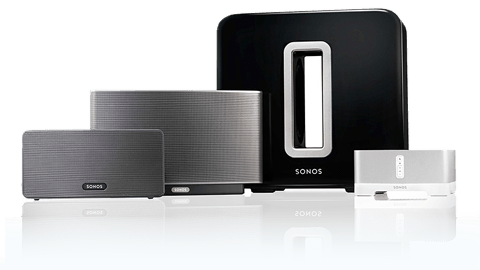 Do you have a Sonos system? Madsonic is for you. Access your personal music library the same way as other Sonos music services like Spotify or Google Play. Works with giant music libraries. Not limited to 65,000 songs like the native Sonos controller. Configure which folders each user is allowed to access. Access your personal Madsonic playlists (as well as Sonos playlists). The Madsonic web app shows who is playing what on Sonos. Artist radio for playing similar songs. Shuffle play whole library or by artist. Album lists: Random, Recently added, Starred, Top rated, Most Played, Recently played, By decade, By genre. Same folder structure / album art / media meta data as in the Madsonic web app. In the Madsonic web page, enable the Sonos music service in Settings > Sonos. In the Sonos controller, click Add Music Services and select Madsonic. Select I already have an account, then enter your Madsonic username and password. You're done. The list of music sources now includes the Madsonic music service. For maximum compatibility, Madsonic is by default transcoding non-mp3 music files to mp3 when streaming to Sonos. However, Sonos natively supports several other audio formats, such as FLAC and OGG. To disable the transcoding in Madsonic, select Settings > Players, select the Sonos player, and then disable the "mp3 audio" transcoding. Sonos music services are uniquely identified by a "SID" (a number between 240 and 253). By default, Madsonic uses SID 244. If you want to make multiple Madsonic servers on your local network available to Sonos, you have to assign a unique SID to each server. This setting is not available through the web interface, but you can add this line to the madsonic.properties file (located in /var/madsonic, c:/madsonic or /Library/Application Support/Madsonic) to change it. Remember to restart Madsonic to make it take effect. Madsonic automatically configures Sonos players on your local network. If Madsonic and Sonos are not on the same network you can still connect them, using a manual one-time registration procedure. Make sure you have the IP address of the Sonos player and Madsonic server available. You can find the Sonos IP by selecting About my Sonos System in the Sonos controller app. Open http://SONOS_IP:1400/customsd.htm in a browser. Finally, in the Sonos controller, click Add Music Services and select the newly added Madsonic music service. Madsonic is not affiliated with Sonos, Inc. Sonos and its product names are trademarks or registered trademarks of Sonos, Inc.